Just Another Touchdown for U.Va. 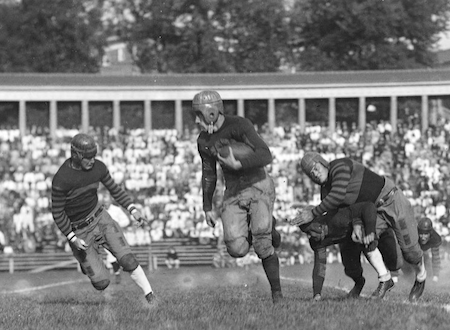 It’s Saturday, so it’s time for another post about UVa’s football song heritage. This week’s contest isn’t one of those like the South’s Oldest Rivalry that has inspired its own set of songs—Virginia has only played Southern Mississippi a handful of times in the history of the program. The contest against Southern Miss in 2009 did not have the best outcome for UVa, so this week’s song is to inspire those members of the Cavaliers community to redouble their energies in supporting the team. Ray! ray!! ray!!! then, and make a mighty din. Yell like hell then and make a mighty din. And in the version performed by the Virginia Glee Club (arranged by Club’s conductor Arthur Fickenscher sometime between 1920 and 1933), the third verse is omitted entirely, but in the second verse the song has “Carolina’s mighty lame” (sometimes “Maryland’s mighty lame”) instead. Yell, boys, yell, boys, Virginia’s on the top. And the ball goes over, Virginia’s got the game. Author Tim JarrettPosted on September 24, 2011 December 1, 2013 Categories Music, VirginiaTags footballsongs, uva, virginiagleeclubLeave a comment on Just Another Touchdown for U.Va. Last Saturday wasn’t the best day in the Jarrett household. Having taught my four year old daughter to sing The Good Old Song, it was a disappointment to lose to Carolina, 28-17. But you have to have a long view in these things. The fight with Carolina is The South’s Oldest Rivalry, after all, and in the long view we’re only back four games (58 Carolina victories, 54 Virginia victories, and 4 ties). But they’ll never, never score. While there’s no good record to indicate how long the song has been around, it may date almost to the beginning of the rivalry. The author of the lyrics, William Roane Aylett, Jr., graduated from the University in 1895 with his medical degree and was in his first autumn on Grounds in 1892 when the first match was played (Virginia won the first match that year in Charlottesville, Carolina the second in Atlanta). 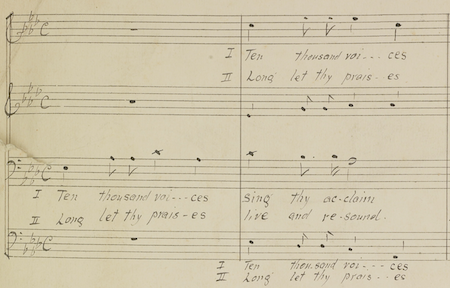 Eleven years later, the song was still in circulation, as evidenced by its presence in A. Frederick Wilson’s collected Songs of the University of Virginia (published 1906). It also appears in a 1911 football program book along with other song texts. And after that, nothing until the Songs of Virginia recording. There’s no evidence that the song was ever performed in a Glee Club concert, for instance–though there would have been lots of opportunities. UNC was the Virginia Glee Club’s oldest partner in its annual fall openings concerts (later “kickoff concerts”), with joint performances with the UNC Glee Club in 1953, 1954, 1955, 1956, and 1977 and with the UNC Women’s Chorus in 1988 (from the records we have handy); none of the programs mention anything about the smell of turpentine. But the song is handy as a reminder: not only did (do) UVa students take this hundred-plus-year rivalry with the Tar Heels seriously, they also sang about it. In the bleachers. At football games. Part 1 of an as yet indeterminate number of posts about why application security has historically been broken, and what to do about it. Software runs everything that is valuable for companies or governments. Software is written by companies and purchased by companies to solve business problems. Companies depend on customer data and intellectual property that software manages, stores, and safeguards. Companies and governments are under attack. Competitors and foreign powers seek access to sensitive data. Criminals seek to access customer records for phishing purposes or for simple theft. Online vigilante groups express displeasure with companies’ actions by seeking to expose or embarrass the company via weaknesses in public facing applications. Software is vulnerable. All software has bugs, and some bugs introduce weaknesses in the software that an attacker can use to impact the confidentiality, integrity, or availability of software and the data it safeguards. The resources required to fix software vulnerabilities are in contention with other development priorities, including user features, functional bugs, and industry compliance requirements. Because software vulnerabilities are less directly visible to customers than the other items, fixing them gets a lower priority from the application’s business owner so fixing them comes last. As a result, most software suppliers produce insecure software. Historically, software buyers have not considered security as a purchase criterion for software. Analyst firms including Gartner do not discuss application security when covering software firms and their products. Software vendors do not have a market incentive to create secure software or advertise the security quality of their applications. And software buyers have no leverage to get security fixes from a vendor once they have purchased the software. The marketplace is not currently acting to correct this information asymmetry; this is a classic market failure, specifically a moral hazard failure, in which the buyer does not have any information about the level of risk in the product they are purchasing. So the challenge for those who would make software more secure is how to create a new dynamic, one in which software becomes more secure over time rather than less. We’ll talk about some ideas that have been tried, without much success, tomorrow. I have the writing bug. So over the next few days I’ll be piecing out parts of an essay around my current work experience in application security. Hang in there, I’m sure there will be plenty of posts with miscellaneous link collections too!